If you're a furry or just want someone friendly to chat with, shoot me a PM! I think I'm going to have to make a world where I try to live in hell. I think it might be hell minerals, there's some black, yellow and brown specks in there. I saw this picture and its nothing like the indev hell. 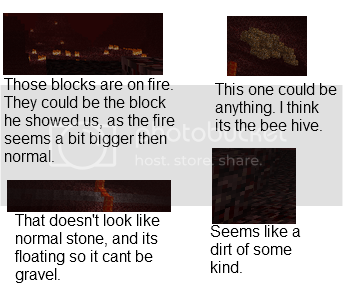 Yeah, indev hell was just the regular map with water replaced by lava. Will I build a portal device, then right click it and let it load me into a separate map? Or will the portal fire up a real-time window to Hell and let me walk in and out seamlessly? The latter would certainly be way cooler than the former, especially considering that you would have to either shut your portals down after use or place anti-monster measures near them in case something not of the "real" world slips out. I hope notch will add trees in the hell world. How could there be a world without trees? But I assume you're not interested because its just the ground. Hmm I know this is just a teaser but it looks a little flat to me... there needs to be more than just rock and lava. Really? Looks just like plain old gravel to me. Something tells me it wouldn't be quite so exciting. yup that looks like some new type of block ( not at all like a bee's nest wtf) I'm more interested in the way the lava falls have dynamic circular ripples much more accurate then previously seen. The lava circular ripple thing is just the way it shows boxes at long range. Build a wall of planks and you get a similar effect. At least, I think. I could be wrong and Notch may have implemented a ripple effect. Either way it does look pretty cool. On-Topic: This is amazing *tears of joy* I can't wait for the 31st. I want to build an evil looking stone castle in there. Right under one of those lave spouts, and find some way to divert the lava around the door, but everywhere else will have lava dropping on it :biggrin.gif: NONE SHALL PASS!!! My walls of awesomeness. The red might just be a reflection of the red tinge that everything in that realm has. Or maybe it's new. Who knows.Looks just like gravel to me though. Image with higher brightness and contrast, because I can. It looks cooler than my hell! The lighter blocks in the upper left are casting light. Pretty sure that's just a byproduct of the repeating textures. You can see that a lot with some blocks when there are a lot of them on a large, flat area in-game. EDIT: Nowhere near ninja'd, but I didn't see the other reply. Now I wish I had a time machine damn I can't wait only 21 more days. Now I know what I'm doing on Halloween besides going to a party.